In honor of the centennial of composer Lou Harrison, composer and author Bill Alves is blogging about the Harrison works on the concerts of MicroFest 2017. 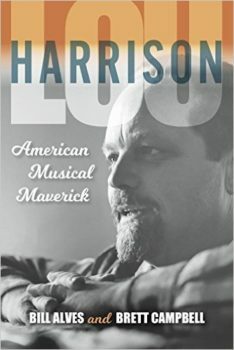 Alves and Brett Campbell are authors of the new and definitive book on Harrison: Lou Harrison: American Musical Maverick, and much of this information comes from that volume. In this post, Alves tells some of the story of Harrison’s well known turn to the Javanese gamelan music during the height of his career, including the background of two works that will be on MicroFest’s April 23 concert with the HMC American Gamelan: Concerto for Piano and Javanese Gamelan, and In Honor of Mark Twain. This free concert is a rare opportunity to hear works from what Harrison considered his most important repertoire. 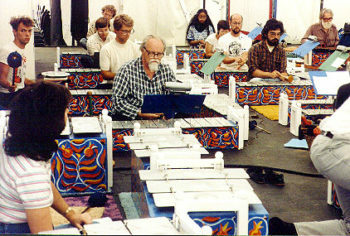 Harrison playing gamelan Si Betty (constructed by him and Bill Colvig). Photo from the Jody Diamond and the American Gamelan Institute. 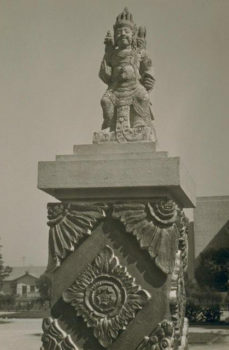 The Dutch East Indies Pavilion at the San Francisco Golden Gate Exposition, 1939. Yet, Harrison claimed that it didn’t occur to him to compose for the ancient ensemble until his friend and teacher, Javanese master musician Pak Cokro suggested it. Harrison was surprised at the suggestion. “You could have knocked me over with a piano!” It’s hard to imagine another composer at the age of 60 who would become a beginner again, but Harrison resolved to respect the centuries of accumulated wisdom that came from the culture that had invented this ensemble, rather than simply use them as sound sources divorced from the context of their origin. So he learned about traditional forms and how their cycles echoed those of Hindu cosmology, about paths the elaborating instruments would weave around the core melody—ingeniously reconciling his love of counterpoint with his love of melody, about the subtleties of its melodic modes and rhythmic shifts. 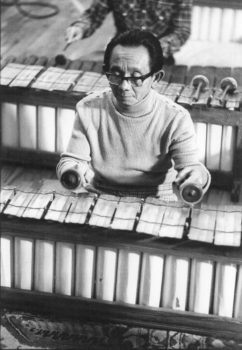 But no Javanese would mistake his compositions for traditional music — Harrison was unafraid to treat his gamelan education as a point of departure, the rest of the journey being guided by his instincts and training as a thoroughly twentieth-century American composer. “It’s a whole world of sound out there, and we’re a part of the world, so it’s also part of us,” Harrison told his student and gamelan player Barbara Benary. “Every classical composer has borrowed from lots around them. Everybody borrows from everybody, but that doesn’t mean that they are trying to injure anybody thereby. It’s just what it is.” Harrison embraced musical hybrids in more than just technical nuances. His compositions for gamelan frequently included Western instruments as quasi-soloists. One of the finest examples is his Concerto for Piano and Javanese Gamelan (composed in 1987 just after his concerto for piano with European orchestra), in which the piano must be retuned to match the pitches of the gamelan. Like a conventional Western concerto, this one has three movements, but they contrast not in their keys but in the Javanese scales used—the first and last use the five-tone slendro tuning system and the middle movement the seven-tone pelog tuning system. Pak Cokro at CalArts in 1976. Photo courtesy of I Nyoman Wenten. We have pacified some thousands of the islanders and buried them, destroyed their fields; burned their villages, and turned their widows and orphans out-of-doors; furnished heartbreak by exile to some dozens of disagreeable patriots: subjugated the remaining ten millions by Benevolent Assimilation, which is the pious new name of the musket….And so, by these Providences of God—and the phrase is the government’s, not mine—we are a World Power. Harrison set these powerful words from America’s great satirist to a choir melody with gamelan accompaniment as In Honor of Mark Twain. 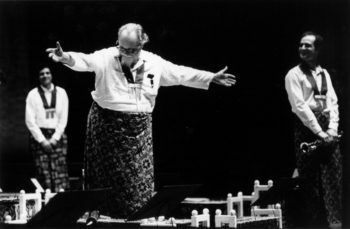 Even as commissions for conventional instruments piled up towards the end of Harrison’s life, his greatest love remained that for the gamelan, and by the time of his death in 2003, he would amass a repertoire of over fifty compositions for the ensemble. Harrison bows after a gamelan performance at Mills College in the 1980s. This sense of gamelan as egalitarian, communitarian music elated Harrison in a way he hadn’t felt since his early 1940s performances of percussion music and early music with his friends in San Francisco. For decades after, he had followed the usual model of writing pieces and turning them over to professionals for performances, distancing himself from music as an intimate creative activity among friends. In the last quarter of his career, gamelan provided an experience in which a group of friends collaboratively create an community of sound.